TV show dates:January 8, 2019 — present. Performers include: Aidan Gillen, Michael Malarkey, Laura Mennell, Ksenia Solo, Michael Harney, and Neal McDonough. 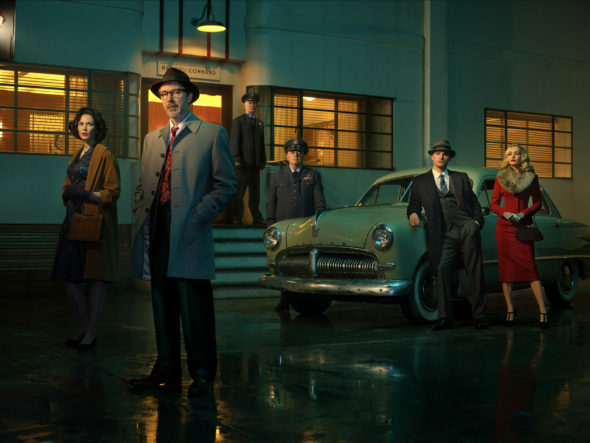 Inspired by the personal experiences of Dr. J. Allen Hynek (Gillen), the Project Blue Book TV series is a scripted drama series, based on the real-life, top-secret investigation into Unidentified Flying Objects (UFOs) and related activity, conducted in the 1950s and ’60s by the United States Air Force. The story centers on Hynek, a top-notch college professor, married to the loyal Mimi (Mennell). The Air Force recruits Allen to lead its secret operation, code name Project Blue Book. On behalf of the government, he then researches thousands of cases — and hundreds of them still remain unsolved. Each episode uses actual case files and UFO theories, with historical events serving as the backdrop. Hynek works under General James Harding (McDonough), a confident man with keen insight who oversees the Project Blue Book division. In turn, General Hugh Valentine (Harney), keeps a close eye on Harding and the new project. Cases explored during the series include the West Virginia Flatwoods Monster Incident; the Fargo, North Dakota Gorman Dogfight; Texas’ Lubbock Lights; and the Chiles-Whitted UFO Incident of Montgomery, Alabama. While delving into these occurrences, it also examines issues including trust, instinct, real news vs. fake, and government coverups, as well as the unknown. What do you think? Do you like the Project Blue Book TV series? Should this TV show be cancelled or renewed for another season on History? I love this show ! There hasn’t been a show this big since X-Files. Please keep this one going. It’s a winner in my book ! I have been waiting for something like this for years. Please expand on this program,it is excellent.